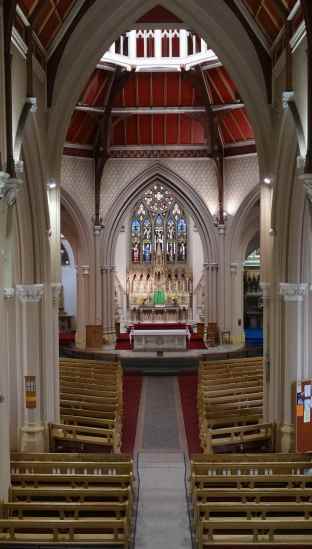 Welcome to the website of Sacred Heart Roman Catholic Church, Blackpool. For the latest news and information about the Parish visit our Facebook page. Sacred Heart Blackpool is a community of faith witnessing the presence of Christ and proclaiming his Good News. We are a worshipping community of locals and visitors to Blackpool celebrating meaningful Liturgy. We are part of the Blackpool Deanery, the Diocese of Lancaster, the Universal Church and we are in full Communion with the Holy See. We are a sign of Christ's presence based right in the centre of Blackpool’s vibrant nightlife. Our Church is open every day from 8am until late for those of any faith and none to spend a few moments of silent prayer and reflection or just to light a candle. The history of this church goes back to the middle of the 19th century. At that time the resident population of Blackpool was about 4000. Catholics alone were without a church. Anglicans, Weslyans, Independents, all had their places of worship, but until the Act of Emancipation in the early part of the century Catholics used to gather in secret at Foxhall and Layton Hall to celebrate Mass. When they were allowed to practise their faith openly the Faithful would walk 4.5 miles (approximately 8km) to the new church in Poulton-le-Fylde. The train to Poulton did not run until 1846 so prior to that the journey was made by coach (and horses) or on foot. With the coming of the railway and the resultant increase of visitors Bishop Browne of Liverpool decided to establish a church in the town. In 1854 Miss Monica Tempest of Broughton Hall, near Skipton, offered to pay for the building of a church. She made it a condition that it must be served by the Society of Jesus, which had long been active in the area. The church has been served by Jesuits for a 150 years of its history. On 26 September 1855, Dr Browne licensed the establishment of a mission in Blackpool. The location in Talbot Road was decided after due consideration of Fox Hall, where the priests had met in secret, and the now site of the Metropole Hotel on the promenade, but Blackpool weather is not always calm and serene and a church built on the sea front would be exposed unduly to the elements. As soon as the site was acquired Mass was said publicly for the first time since the Reformation in the vault of the inn next door by Fr George Bampton S.J. A plaque commemorating this was placed on the hotel wall in 1993 by the Blackpool Heritage Committee. On 7 June 1856 the foundation stone was solemnly laid. 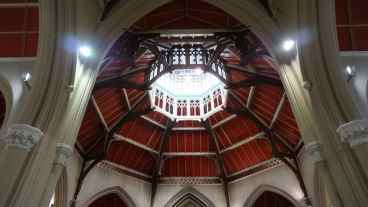 Edward Pugin, son of Augustus Welby Pugin (famous architect) designed the original chapel. This consisted of the western part of the present church (to the left of the Talbot Road entrance). The Rt Rev Dr Goss, the Catholic Bishop of Liverpool (the Diocese of Lancaster was not established until 1924) dedicated the church to 'The Sacred Hearts of Jesus and Mary'. 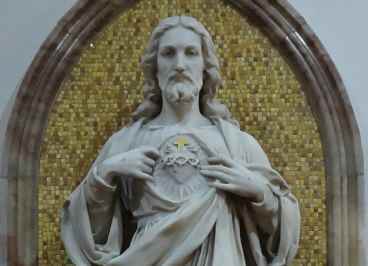 Over the years the plural 'The Sacred Hearts' was dropped and now the official title is 'The Church of the Sacred Heart'. Less than 10 years after its opening the church was judged too small to accommodate the increasingly large numbers of visitors, but it was only in the 1890's that extension work began. Peter Paul Pugin, another son of Augustus Pugin, drew up plans that would leave the original building for the most part intact. The original High Altar and Lady Chapel were moved eastwards and the new octagon with its lantern inserted. This provided seating for an additional 450 people. The church was reopened on Trinity Sunday 1894. The alterations had cost £8,000. This work gave us most of the church we see today. It is 169ft (56m) long, 90ft (30m) broad at its widest point; the tower is 109ft (36m) high and the lantern, to the top of the cross that surmounts it, is 97ft (32m) high. The lantern (renovated in 2011) is 20ft (6m) in diameter. The building is built of brick with stone cladding. By 1914, the original stonework was badly corroded in many places, and the Superior at the time, Fr Robert Moss S.J. ordered a thorough renovation. The money required to start the operation was made by a Grand Bazaar held in the Indian Lounge of the Winter Gardens. The bazaar lasted for 5 days and raised £2,130. The first phase started with work on the Talbot Road porch. The second phase involved the dismantling of the top third of the tower and its reconstruction. A solemn re-opening was held on 12 September 1915. However, the First World War forced the suspension of work and it was not until December 1930 that the renovation of the stonework was completed. In the meantime, the last substantial addition to the church, the baptistry, had been made. This was dedicated as a memorial to those who died in the Great War of 1914-1918. As post-Vatican Council liturgy requires baptism to be celebrated in the sanctuary, the Baptistry was re-opened in 1996 as a Chapel of Peace in memory of all who died in the 20th century wars. In 2005 the new Baptistry was opened in its present location and the chapel remained as a memorial to the Jesuits who served the parish and became the St Ignatius of Loyola Chapel. The Catholic Stage Guild held their Annual Mass here and so it is rather curious and interesting that there is a cinema organ in the west gallery. In the 1930's the arrival of the 'talking pictures' rendered the original cinema organ redundant. Consequently, in 1935, the then Parish priest, Fr Oldham S.J. learned that the Waterloo cinema organ was up for sale. Having put the instrument through its paces, he made a successful bid of £150 for an Organ that originally cost some £3,000. Messrs Jardine and Co of Manchester duly installed the organ, along with its fine panelling of American mahogany. On 26 April 1936, there was an inaugural recital by the organist of Lancaster Cathedral, Dr Reginald Dixon. Some 650 people attended. It is said that many came expecting to enjoy the artistry of the other Reginald Dixon, 'the Wizard of the Blackpool Tower Mighty Wurlitzer'! The Second Vatican Council (1962-65) with its changes in the liturgy brought about some radical reordering. In 1972 under the guidance of Fr Joseph Corbishley S.J. the new semi-circular sanctuary was constructed. The side altar at St Joseph's shrine was installed as the new high altar, facing the congregation, and the benches under the lantern were re-arranged around the sanctuary to involve the congregation more closely in the liturgical action. By the mid eighties, the then Parish priest, Fr Frederick Lane S.J. had the church completely re-decorated, while his successor, Fr Manus Keane S.J. in 1993, retained architect Maureen Kelly to draw up a detailed report on the state of the structure. At this point, English Heritage classified the church as a Grade 2* building, that is, a building of exceptional merit and interest. The Parish, with a grant from the Society of Jesus, financed urgent work on the pinnacles of the tower, and renewed the entire stonework of the great west window. English Heritage offered a generous grant of 40% towards the cost of the remaining work to the roofs, the windows on the south side, as well as the replacement of eroded stonework and extensive pointing. In more recent years renovation and decoration has taken priority so that the Church of the Sacred Heart will continue to be a place of peace, joy and consolation to many. Subsequent bids for Lottery funding have fell on deaf ears but the work of repair and maintenance goes on. The church has been made 'disabled friendly' with the installation of the ramp and, in keeping with recent legislation, a fully fitted disabled toilet has been installed. 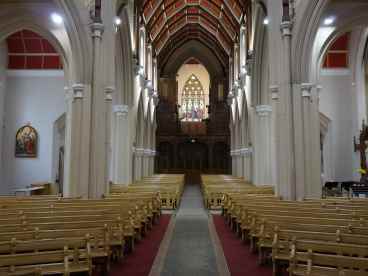 On April 18 2004 the Jesuits left and the Church is served by Lancaster Diocese. With the support of continued donations and fund raising events it is hoped that the Church of the Sacred Heart will continue to be a place of refuge to those in need, in the future, as it has been in the past. Weekday Mass times may vary from week to week due to the liturgical year, feast days and funerals. Check the Facebook Page for up-to-date details, a general schedule is below. Canon Dewhurst has served as our Parish Priest since 2007 when he succeeded Canon Ned Carey. He was ordained on 27 May 1972 on the feast of St Augustine of Canterbury and has served in several Parishes in Blackpool, Carlisle, Barrow and Cleveleys. Canon Dewhurst is a member of the Cathedral Chapter of Canons and he also serves on the Diocesan Property committee. Canon Dewhurst is also a keen golfer and enjoys a game of darts! Lancaster Diocesan Trustees, registered charity number: 234331.